Create instant lapbooks with these 15 ready-made and EDITABLE templates! Upon purchasing, you have full rights to use these for PERSONAL OR COMMERCIAL USE. In fact, that's why I created them! I got frustrated having to search for templates I could use to create my own lapbooks to sell, so I just made some! I hope they help you too! 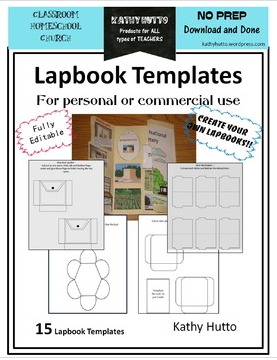 This resource also includes a Sample Lapbook you can use as a template to create your own lapbooks from books or subjects. This product is for teachers of ALL age groups!